FULTON, NY – Director of Catholic Charities of Oswego County’s CYO program, Jim Smiley announced that there will be a special drawing for an official New York Islander hockey jersey, autographed by local hockey hero, Rob Schremp, as part of the CYO’s Rock the Rim For Youth Basketball Tournament. Now in his sixth season in the National Hockey League, Fulton native Rob Schremp, began his NHL career with the Edmonton Oilers before moving on to the New York Islanders. He is currently a center for the Atlanta Thrashers. Justin Sheppard of the Catholic Charities’ CYO program accepts an official New York Islander hockey jersey, autographed by local hockey hero, Rob Schremp, from Jerry Schremp (right). “We are thrilled to be able to offer such great piece of NHL memorabilia as this New York Islanders jersey that Rob has autographed for us. 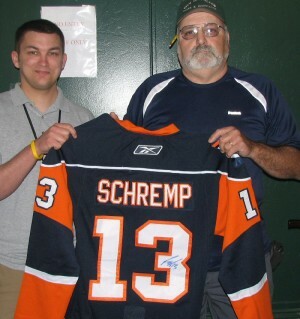 We are especially thankful to Jerry Schremp for helping us procure the jersey,” said Smiley. The official NHL New York Islanders jersey, autographed by Schremp will awarded during a drawing to be held during the CYO Rock the Rim For Youth Basketball Tournament. Tickets for the drawing, which are currently available at the Catholic Charities, 365 W. First St., will also be available at the event. The tournament serves as a much-needed fundraiser for the CYO program. All proceeds from the event as well as the drawing for the official NHL New York Islanders jersey, autographed by Schremp, will benefit the CYO Program. The tournament offers competition for all ages as there will be two brackets, ages 16 – 30 and 30 and over with a limit of eight teams per bracket. A prize will be awarded to the winners of each bracket and all youth participating in the shoot-out will receive an award. Tip-off for the CYO Rock the Rim for Youth Basketball Tournament is set for 3 p.m.
A limited number of entries are still available in each bracket for teams interested in competing in the tournament. Registration fee is $150 per team with a maximum of eight players per team and includes a commemorative T-shirt for each team member. For a $1 donation, participants in the youth shoot-out will receive five shots. For more information, call Meghan Rey at Catholic Charities, 598-3980, ext. 222.